The Republic of Slovenia is a democratic state in the southern part of Central Europe. The state borders on Italy in the west, Austria in the north, Hungary in southeast and Croatia in south and east. Slovenia consists of 20.273 km². The capital is Ljubljana. 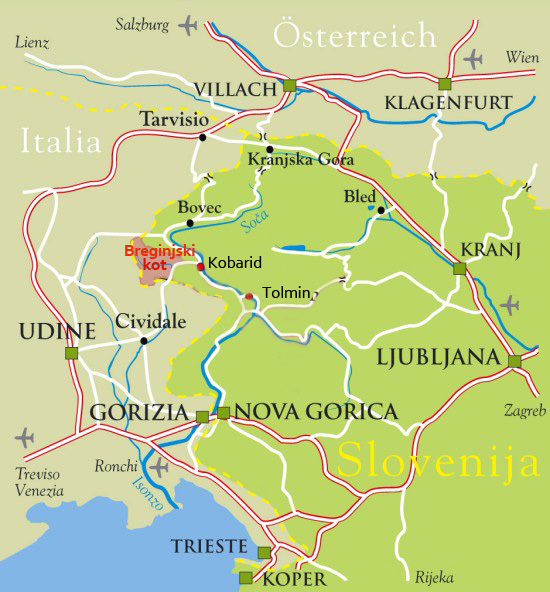 Slovenia is a member of the EU and a part of the Schengen treaty area. For a small country it is very diverse since it combines geographic regions of the Alps, the Mediterranean, the Pannonian basin and the Carstic world. One travels quickly from the high mountains to green pastures and the windswept sea coast. Breginjski kot is the westernmost part of Slovenia. It lies in the subalpine region west of Kobarid. The area is defined by Stol to the north and Matajur, Mija and Lubija to the south. The valley is dominated by the river Nadiža. – from Štajerska (Steiermark) (Maribor) and central Slovenia (Ljubljana): You travel through Idrija, Tolmin and Kobarid or on the highway from Ljubljana to Nova Gorica and from there to Tolmin and Kobarid. In Kobarid you take a right towards Robič and Italy. In the village of Staro Selo you take a right turn for Breginj. 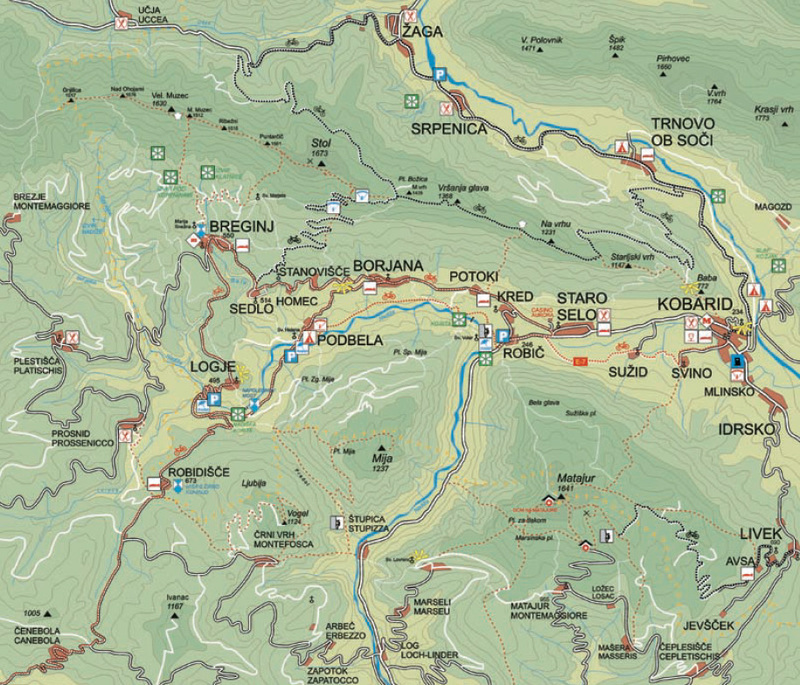 – from Gorenjska (Bled, Kranjska gora): You travel over the Vršič pass to Bovec and then to Kobarid or you pass Škofja Loka and travel over Sorica or Kladje pass towards Tolmin. In Kobarid you take a right towards Robič and Italy. In the village of Staro Selo youtake a right turn for Breginj. – from the coast (Koper): You take the highway to Nova Gorica and then drive towards Tolmin and Kobarid. In Kobarid you take a right towards Robič and Italy. In the village of Staro Selo you take a right turn for Breginj. – from Gorizia: You cross the border in Vrtojba and head to Nova Gorica. From Nova Gorica you drive towards Tolmin and Kobarid. In Kobarid you take a right towards Robič and Italy. In the village of Staro Selo you take a right turn for Breginj. – from Udine and Cividale: You travel towards the old border crossing Robič (Stupizza). From there you drive to Staro Selo where you take a left for Breginj. – from Gemona del Friuli: You travel from Tarcento Nimisa and Taipana to the old border crossing Most na Nadiži (Ponte Vittorio). From there you have about 5km to Breginj. You travel from Villach towards Tarvisio in Italy. From there you take the Predil pass and arrive in Bovec. From Bovec you travel south to Kobarid. In Kobarid you take a right towards Robič and Italy. In the village of Staro Selo you take a right turn for Breginj. The train runs from Ljubljana to Jesenice and from there through Baška grapa to the train station in Most na Soči. 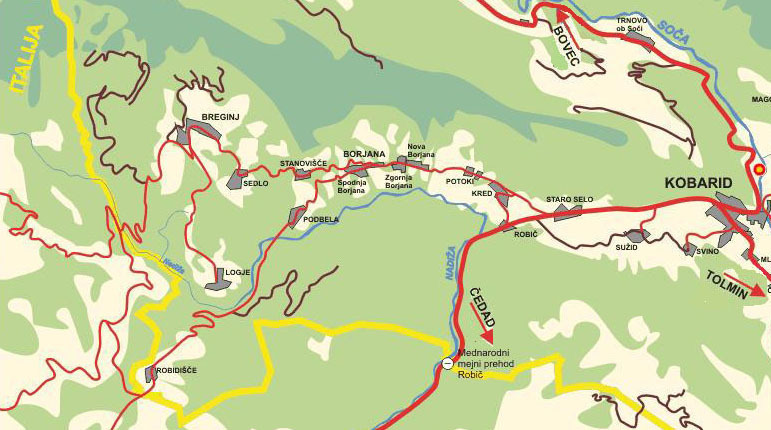 From Most na Soči there is about 30km to Breginjski kot, which has to be travelled by bus or car. The train timetables are available on Slovenian railways webpage (http://www.slo-zeleznice.si/). There is also a car train operating on the Bohinska Bistrica – Podbrdo – Most na Soči line. There are regular bus lines Kobarid-Breginj, Ljubljana – Tolmin – Kobarid and Nova Gorica – Kobarid –Breginj. The timetables are found on Avrigo webpage (http://www.avrigo.si/potniski_prevozi/linijski_promet/vozni_red/ ). Venice Marco Polo airport –205 km from Breginj. Venice Treviso airport –215 km from Breginj. Klagenfurt airport –145 km from Breginj.